The name Fassa (attested in documents as far back as the 13th century in the form Fascia, Faxia, Fassia) is thought to derive from Latin and refers to the firs "fascia" or strip of cultivated land on the valley bottom. The name recurs with the same meaning in many of the sorrounding valleys. The annexation of Rhateia (from Rhaetians the name that the Roman historians gave to the peoples settled in the alpine region north of Verona and Como) to the Roman Empire led to the spread of the Latin language among the indigenous population.Vulgar Latin, brought by the Roman soldiers and merchants, underwent a change over the centuries, developing into what is called Rhaeto-Romance or the Ladin language. There is evidence to suppose that in the past there was a vast area of Ladin culture which stretched from the head of the Rhine to Trieste and from the Danube to Lake Garda. The area around Val di Fassa was inhabited before the arrival of the Romans by the Rhateians, a mysterious people whose origins are obscure, left plentful archaeological traces of their presence: settlements and material evidence of groupsof humans belonging to the Rhaetian culture have been found in abundance in Val di Fassa dating to the Second Iron Age (5th century B.C.). The language of this ancient people left traces also in some place names such as Alba which, like the similar names Sot Elbes, Alboline, etc., probably derives from the pre-Latin *alb, *alp "rock, face", from which the name Alps. Over the centuries that followed the fall of the Roman Empire a huge number of migrating peoples interrupted this conitnuity in this area: the Alemanni and Bavarians swept down from the north while the Slav peoples arrived from the east (600 A.D. ca.). Finally the area was annexed to the Venice Republic with the diffusion of Veneto dialects. But the old Ladin language survived to all these linguistic contributions. Ladin is a Romance language like italian, French, Catalan, etc. with its original and distincitve features. Today, it is made up of a number of local dialects which together share a sufficeint number of features to form one linguistic system. If you want to know more about this visit or contact the Ladin Cultural Institute at Vigo di Fassa in the old centre of San Giovanni. 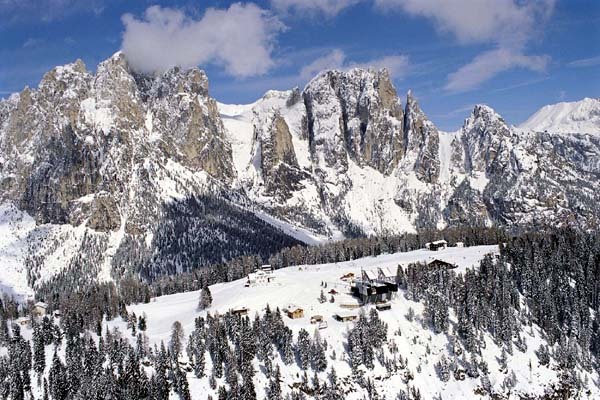 In winter, the Val di Fassa is first and foremost for skiing, but it is also an enchanting place bursting with natural wonders, fun and cultural interest. While nature is sleeping under the snow, the fun runs wild on the slopes by day and in the pubs and discos by night: an unforgettable holiday among the most beautiful mountains in the world. 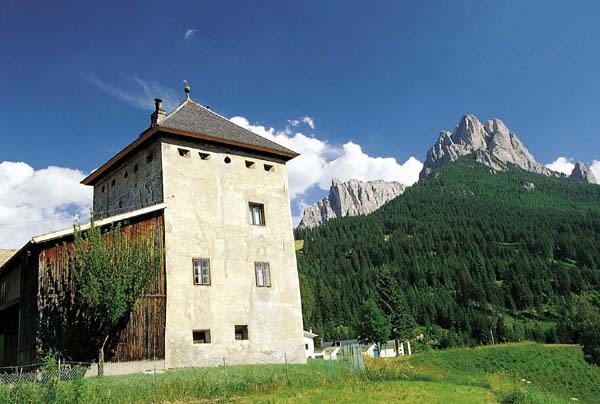 In summer the Val di Fassa Dolomites take hold of you and draw you in. It is an explosion of energy and colours, all emotions to live and discover. The attraction of King Laurino's realm changes daily and displays a fantastic kaleidoscope: the widest range of sporting activities, nature and leisure, grand events and shows, promotions. 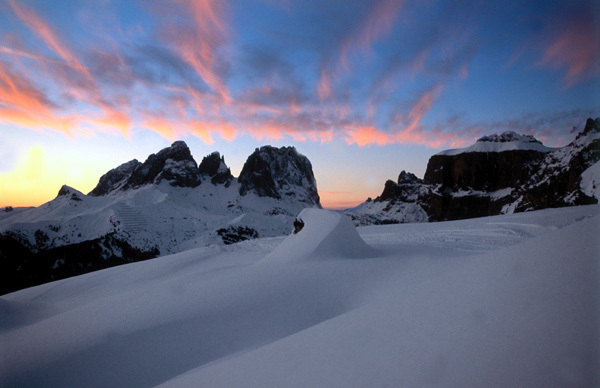 In the valley there is continual excitement from the sweet-sounding environment: a pot-pourri of smells and flavours, views, the music over which preside the unchallenged kings, and rocky peaks of rare beauty: Catinaccio, Sella, the Monzoni, Marmolada, queen of the Dolomites. A unique scenario, and thus unmistakable, just as the hospitality and generosity of the Fassa Ladins are unique. And in summer the tradition continues: you arrive as guests and leave as friends. In Summer Val di Fassa shares with other valleys an unique event in the whole Alps: The Sounds of the Dolomites. 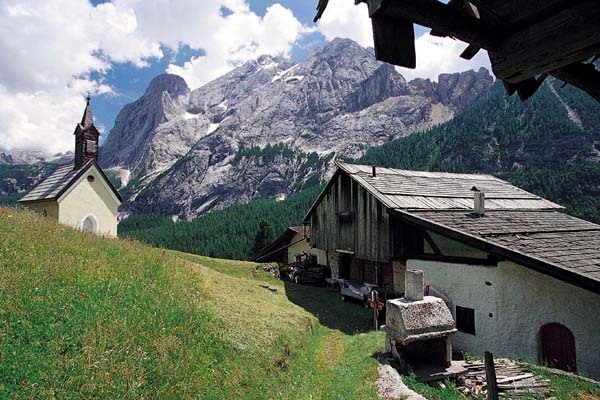 It is a high altitude music festival realised by the Azienda per la Promozione Turistica. It unites the passion for music and mountains, art and the environment in a cycle of mountain concerts and walks, in the name of freedom and love for nature. Musicians of international renown, who love the mountains, paricipate in the festival: Uto Ughi, London Brass, Mario Brunello, Richard Galliano, Giovanni Sollima, etc.